The Kunsthal takes a broad view of education in planning its main exhibitions and actively approaches the various educational establishments (in Rotterdam) in this connection. Thanks to various covenants and forms of collaboration, the Kunsthal manages to put on a relevant and inspiring programme for schools with each major exhibition. Feedback from the active teachers’ panel ensures that the educational programme seamlessly matches the core objectives of the curricula so that a visit to the Kunsthal will have an added value for school pupils and students. The Kunsthal has had a covenant with ROC Albeda College since 2011. It also works closely with Stichting BOOR, De Theaterhavo/vwo, Stichting Kunstzinnige Vorming Rotterdam (SKVR), Kenniscentrum Cultuureducatie Rotterdam and Digital Playground. During these afternoons, teachers can see how a visit to the Kunsthal is perfectly in sync with the curriculum. Twice a year the Kunsthal organises a Wednesday afternoon with an introduction, an explanation of the educational programme, and a visit to the exhibitions. To liven the afternoon up even more, the Kunsthal often invites guest speakers. In 2015 well-attended afternoons specially for teachers were organised on Wednesday 18 March and 7 October. The guest speakers included Emiel Heijnen, member of the CKV innovation committee, and film director Johan Kramer. For primary education a teaching package could be downloaded free of charge for the main exhibitions ‘Krištof Kintera. Your Light is My Life’ and ‘Keith Haring. The Political Line’. It contained a preparatory lesson for the digital blackboard, a full-colour printed viewer’s guide and a lesson to work through the material. Groups 6,7 and 8 could follow a Look & Do tour. In the context of the Rotterdam Cultural Trajectory – in collaboration with Kenniscentrum Cultuureducatie Rotterdam (KC-R) – pupils from groups 7 and 8 and pupils from the second year of secondary education were introduced to ‘Out of the box / in the box’. The exhibition of Kintera was visited accompanied by two art teachers and the pupils developed these themes in a Surrealist work of art of their own. Educational packages were developed for secondary education to accompany the major exhibitions, which were both visited by very large numbers of secondary school pupils. The Keith Haring exhibition also matched one of the subjects of the final secondary education examinations. A special workshop for the Haring exhibition was developed in collaboration with Digital Playground, the centre for media education, for pupils from secondary and intermediate professional education. A special educational package was put together in collaboration with the ROC Albeda Rotterdam for all intermediate professional education levels and courses. Around 40% of independent school visits took advantage of the CJP Cultural Card. 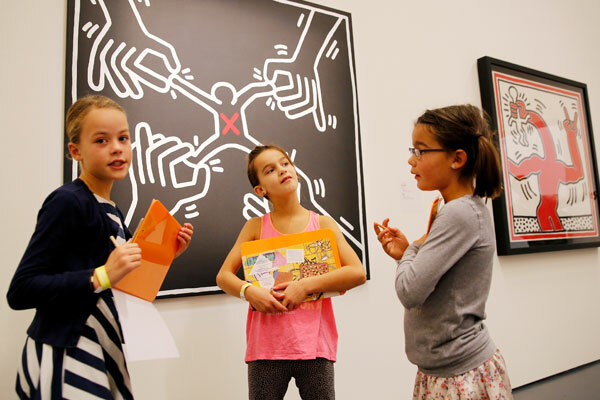 More than 5,000 pupils visited the Kunsthal with the Cultural Card, which is used exclusively by secondary schools. The breakdown for the different types of school is: pre-university education 39%, higher general secondary education 30%, and intermediate professional education 30%. 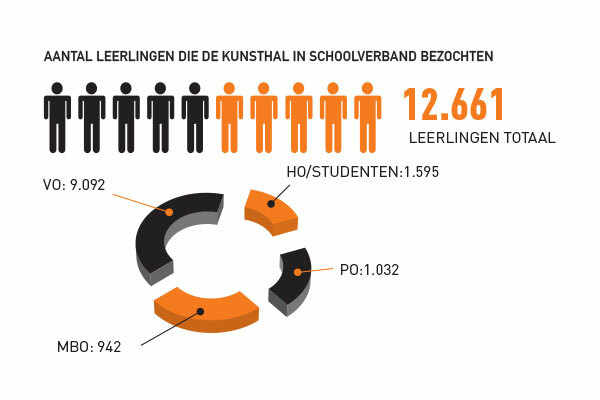 This breakdown of visitors via the CJP Cultural Card corresponds to the types of secondary school that visit the Kunsthal. The statistics show that the Kunsthal threshold is low for all types of secondary education and that the educational programmes developed provide sufficient scope for differentiation.